AllegroMedical.com presents The Special Tomato® Soft-Touch™ Sitter Seat - Seat And Mobile Base. The Special Tomato® adaptive seating systems are available in various sizes, colors and modular offerings. The Size 4 Soft- Touch Sitter with Mobile Wedge Kit from Special Tomato® is adaptive Seating at its best specially developed for children aged 9-13 years old! The Special Tomato® Soft-Touch™ Sitter Mobile Tilt Wedge Kit is now available in chocolate! The rich chocolate color of the seat is offset by a lilac or tan harness to add a punch of color to the wonderful seat. 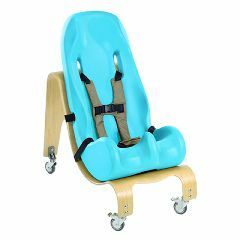 The Sitter with Mobile Tilt Wedge Kit offers children with mild to moderate physical involvement a mobile seating option. The Special Tomato® Soft-Touch™ Sitter is combined with a wooden base made mobile with casters. Four casters are included, allowing your child to move from one area to another with ease and without compromising their posture and position. Weight capacity: 50-110 lbs.